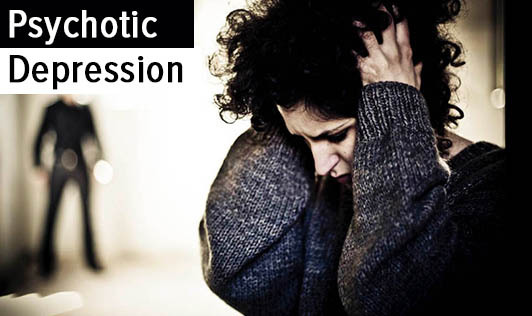 Psychotic depression refers to a severe mental illness and can be a psychiatric emergency. This type of depression is characterized by depressive symptoms along with hallucinations or delusions. Psychotically depressed people often become paranoid or come to believe that their thoughts are not their own and that others can "hear" their thoughts. Psychotic depression occurs in major depressive disorder or in bipolar disorder. For most people, depression usually starts with symptoms of sad mood, feelings of hopelessness, irritability, changes in sleep, energy or appetite. The cause of this condition is unknown. One may be at an increased risk of developing psychotic depression if he or she has a family history of severe mental illness. This type of depression is said to be more common in women than in men. Psychotic depression is a serious condition and people with this condition are at an increased risk of suicide. Please seek immediate help if you or a loved one has been experiencing symptoms of psychotic depression.